The Spanish prime minister has rejected a call from Catalonia’s leader for fiscal independence, days after a giant pro-autonomy rally in Barcelona. 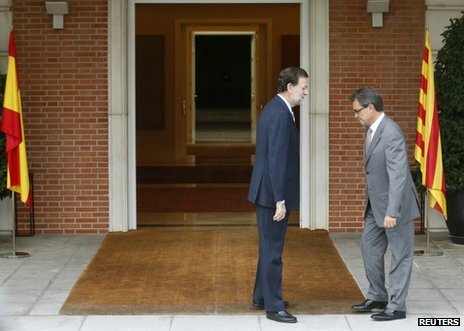 Mariano Rajoy received Artur Mas for talks in Madrid at which he told him that Spain’s economic crisis had to be overcome jointly, a statement said. Mr Mas said he was disappointed and did not rule out early regional elections. The crisis has fanned an independence movement in Catalonia, which produces a fifth of Spain’s economic output. Last week, one and a half million people rallied in Barcelona, the regional capital, in what was seen as a show of strength for the pro-independence lobby. Correspondents say Mr Rajoy is wary of any of Spain’s regions seeking to break away amid the economic crisis. Early elections in Catalonia could be seen as a referendum on autonomy, piling pressure on the central government.